Evelyn Francis McHale (September 20, 1923 – May 1, 1947) was an American bookkeeper who took her own life by jumping from the 86th floor Observation Deck of the Empire State Building on May 1, 1947. Manhattan, New York, New York, U.S.
A photograph taken four minutes after her death by photography student Robert Wiles has become an iconic suicide photograph, referred to as "the most beautiful suicide". Evelyn McHale was born in Berkeley, California one of nine children to Helen and Vincent McHale. Vincent was a bank examiner and relocated to Washington D.C. in 1930. Her mother suffered from undiagnosed and untreated depression. This led to a challenging marriage, and ultimately a divorce. Vincent gained custody of all children and moved to Tuckahoe, New York. After graduating from high school Evelyn joined the Women's Army Corps, and was stationed in Jefferson City, Missouri. She later moved to Baldwin, New York and was employed as a bookkeeper at the Kitab Engraving Company on Pearl Street. She met her fiance Barry Rhodes, a college student discharged from the United States Army Air Force. On April 30, 1947, McHale took a train from New York to Easton, Pennsylvania to visit Rhodes. The next day, after leaving Rhodes' residence, she returned to New York City and went to the Empire State Building where she jumped from the 86th floor observatory. A security guard was reportedly standing approximately ten feet from her just before she jumped. I don't want anyone in or out of my family to see any part of me. Could you destroy my body by cremation? I beg of you and my family – don't have any service for me or remembrance for me. My fiance asked me to marry him in June. I don't think I would make a good wife for anybody. He is much better off without me. Tell my father, I have too many of my mother's tendencies. Her body was identified by her sister, Helen Brenner. In accordance with her wishes, she was cremated with no memorial, service or grave. Her then-fiance Barry Rhodes became an engineer before moving south. He died unmarried in Melbourne, Florida on October 9th 2007. The photo of her body, taken by Robert Wiles, has been compared to the photograph by Malcolm Wilde Browne of the self-immolation of Vietnamese Buddhist monk Thích Quảng Đức who burned himself alive at a busy Saigon road intersection on June 11, 1963, which is widely regarded as among the most iconic suicide photographs. Ben Cosgrove of Time described the photo as "technically rich, visually compelling and ... downright beautiful". Cosgrove described her body as "resting, or napping, rather than ... dead" and appears as if she is "daydreaming of her beau". Andy Warhol used Wiles' photo in one of his prints entitled Suicide (Fallen Body). Her picture was also used on the cover of Saccharine Trust's album Surviving You, Always, released in 1984 by SST Records. David Bowie's 1993 video for the single "Jump They Say" includes a recreation of the image, with the singer splayed atop a smashed car. The cover of the 1995 album Gilt by the Tucson band Machines of Loving Grace uses a color photo that recreates the original image. The cover of the 2009 album “Backspacer” by the band Pearl Jam features an artist rendition of the iconic photograph in the bottom right corner. The shot is also referenced at the start of Taylor Swift's 'Bad Blood' video. ^ Time Inc (May 12, 1947). LIFE. Time Inc. pp. 42–. ISSN 0024-3019. ^ a b Ben Cosgrove (March 19, 2014). "'The Most Beautiful Suicide': A Violent Death, an Immortal Photo". TIME.com. Retrieved April 18, 2016. ^ Page, Max (April 23, 2006). "Crashing to Earth, Again and Again". New York Times. Retrieved April 18, 2016. ^ "The Birth of Evelyn Mchale". California Birth Index. Retrieved May 30, 2016. ^ "Evelyn Mchale". Codex99. Retrieved 16 November 2018. ^ a b c Robert C. Wiles (February 27, 2014). 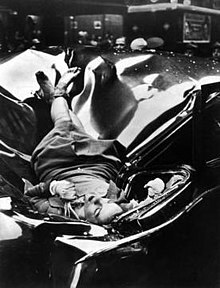 "The Most Beautiful Suicide: Evelyn McHale Leapt to Her Death from the Empire State Building, 1947". Rare Historical Photos. Retrieved April 18, 2016. ^ "Evelyn McHale: A Beautiful Death on 33rd Street". Keith York City. October 24, 2012. Retrieved April 18, 2016. ^ Reporter, Staff (November 27, 2015). "The Wild and Dark History of the Empire State Building, One of New York City's Most Recognized Landmarks, and Known for its Record-Breaking Height". Realty Today. Retrieved April 17, 2016. ^ Conaboy, Kelly (September 25, 2015). "Specter Detector: Courting the Empire State Building's Prettiest Ghost". Gawker. Archived from the original on April 25, 2016. Retrieved April 18, 2016. ^ Dillenberger, Jane D. (February 1, 2001). The Religious Art of Andy Warhol. A&C Black. p. 67. ISBN 978-0-8264-1334-5.